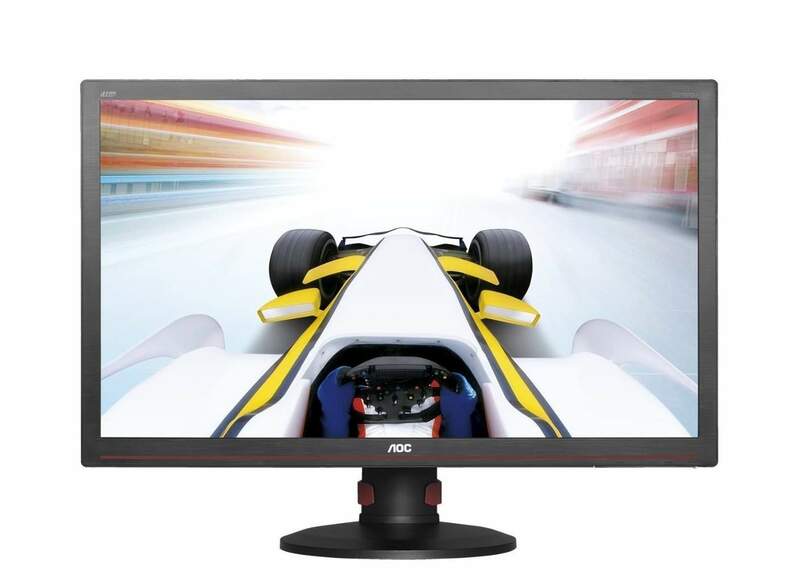 The AOC E2425SWD is a budget monitor which delivers Full HD resolution, immersive image quality, and plenty of exclusive features. It is Energy Star certified for its eco-friendly design and power-efficient performance. Apart from having a brilliant picture quality, there are a lot of configurable options in the OSD menu, as well as some pre-calibrated picture presets which enhance the image by incorporating a remarkable 20,000,000:1 dynamic contrast ratio. The first thing that captures the attention as the AOC E2425SWD turns on for the first time is the crispiness of the image. The 1080p resolution on a 24-inch screen monitor results in rich and expressive details and sharp picture quality. Alas, the colors aren’t as rich as they are on the more expensive IPS panel monitors, but once properly tweaked and calibrated in the OSD settings, colors get a more engaging tone. No complicated procedures are required for calibration as just some basic tinkering in the user-friendly menu will improve the image quality. For instance, the Picture Boost feature in the OSD menu allows you to configure picture adjustments to just one part of the screen in order to compare the difference, after which you can apply the settings to the whole screen. Additionally, there are several well-optimized picture presets which use optimal settings in order to provide you with the best viewing experience possible according to the activity on the screen. These presets include Text, Internet, Game, Movie, Sports, and the Standard mode. As expected, the TN panel of the AOC E2425SWD provides limited viewing angles which amount to 170 degrees horizontal and 160 degrees vertical. This means that if you wish to, for example, lie down on a bed to watch a movie, you’ll have to tilt the screen of the monitor to match the angle in which colors won’t shift and lose on tone. When sitting in front of the monitor, the image quality will remain perfect. The response time of 5ms will eliminate most of ghosting and trailing of the fast moving objects; in fact, you’ll only be able to notice minor ghosting in fast-paced video games making the AOC E2425SWD a great gaming monitor for the price. There are five OSD buttons at the bottom bezel of the AOC E2425SWD which can be used as shortcuts when the OSD menu is not open. Starting from the left hotkey to the last you can, swap between input sources or auto-adjust if only VGA port is active, enable/disable the dynamic contrast ratio and toggle between the picture presets, change aspect ratio (4:3 or 16:9), open the OSD menu, and turn off/on the monitor. Once you enter the OSD, you will open a wide, comprehensive, and user-friendly menu that’s stretched across the bottom of the screen. Under the luminance section, you can adjust contrast, brightness, three levels of gamma, and toggle the dynamic contrast and the pre-calibrated presets. Besides the mentioned picture boost features and the analog VGA settings, you can also access the color settings which consist of color temperature presets and user configurable red, green, and blue color levels. The CD which comes with the AOC E2425SWD features two software applications including the iMenu and the eSaver. The former allows you to adjust all OSD settings in a desktop application rather than by using the OSD buttons while the latter provides you with various options for setting up a custom timer after which the monitor will automatically turn off. 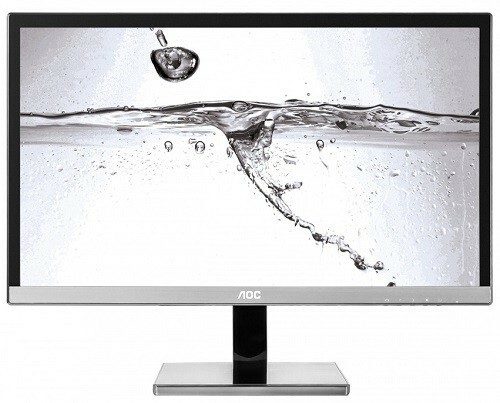 The design of the AOC E2425SWD involves a glossy black cabinet and a somewhat thick bezel which makes the monitor appear bigger than it actually is. The screen of the monitor is covered with a matte finish in order to eliminate the sunlight reflection. 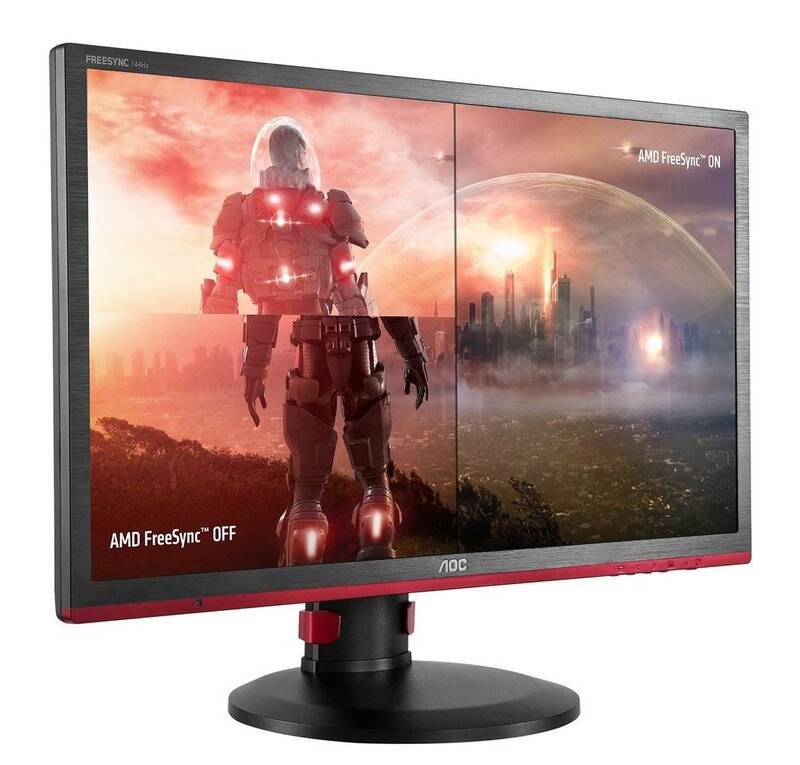 The base of the monitor is easily detachable which allows for quick and easy wall installment as the AOC E2425SWD is VESA mount compliant as well. Only the screen of the monitor is adjustable by -3, 11 degrees tilt. The AOC E2425SWD feature a DVI-D and a VGA port, although only a VGA cable is provided with the purchase. Along with the monitor and its base, you will also receive the CD with drivers and software, warranty, a power cord, and a user’s manual. 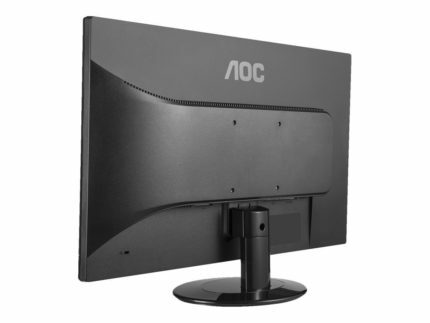 At the moment (March 2017), the AOC E2425SWD is available for $110. Given its crisp Full HD resolution, exclusive features, and configurable image quality, the price is quite reasonable. 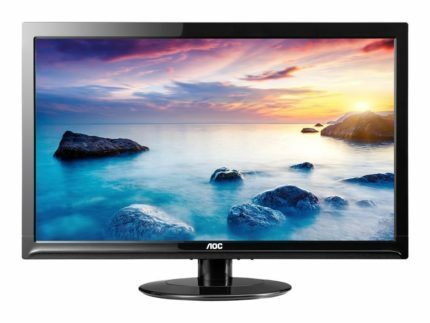 This monitor is also available in different sizes including 20-inch, 22-inch, and 27-inch, at affordable prices as well. You can check them out at the following links, the AOC E2050swd, the AOC E2228swdn, and the AOC E2752She. The AOC E2425SWD delivers a crisp Full HD resolution for an immersive multimedia experience whether playing video games or watching movies at 1080p. Additionally, it’s very responsive and offers next-to-none ghosting in the most engaging fast actions in video games. Once the picture is a bit tinkered in the OSD, it can produce a much better image quality than out of the box. All in all, for the price it costs, the AOC E2425SWD offers outstanding exclusive features and sharp image quality with a sleek and modern-looking design. The AOC E2425SWD delivers crisp and sharp Full HD resolution for immersive high-quality movie watching experience as well as responsive gaming at 1080p. Moreover, it comes with plenty unique features as well as exclusive software applications such as eSaver and iMenu for easier picture configuration and greater power efficiency.